Japan's Atomic Bomb research project began quite independently of Nazi Germany's Atomic weapons project. Germany was quite unaware of Japan's efforts until an exchange of diplomatic signals from July to November 1943. Undoubtedly from this time however there was a rush of technical exchanges between the Axis partners. This was hinted by Hitler's decree of September 1944 (BFHQ 219/44) requiring maximum co-operation of all German Armed Forces with Japan. Efforts in Japan by individuals and groups of scientists to develop an Atomic Bomb began as early as 1937. Scientists formed a Colloquiem to press both the Army and the Navy for funding to develop such weapons long before Pearl Harbour in 1941. During much of World War 2 there were two Japanese teams working in isolation to create an Atomic Bomb. In 1944 these teams were amalgamated to rationalise their efforts. This gave rise to many postwar claims that the Japanese Army's project under Yoshio Nishina was abandoned. It did infact cease, however it's efforts were resumed by a succeeding project. The Imperial Japanese Navy (IJN) and the Imperial Japanese Army (IJA) were fierce rivals who viewed each other with contempt and suspicion. Co-operation was non-existent between these two armed forces. They duplicated everything. For example each had an air force operating aircraft which shared no engines, or components in common. Even machine guns used different calibres, so that neither branch of the military could use the other's material. Into this bizarre situation was injected an ambition by each service to out-do the other obtaining nuclear weapons. Japan's Navy was intoxicated by it's early success in the Pacific and at first did not believe Japan would need the advantage of Atomic weapons, but reversals in the Battle of Coral Sea and the Battle of Midway began to change the Navy's thinking. The Army however showed more interest as early as 1940. Even from the very start the Japanese Navy set up a secret scientific advisory committee distinct from the Physics Colloquiem. It was from the advice of this group that the navy withdrew support for the Nishina Project in March 1943 to find a better approach. The Navy's parallel, but stubbornly different nuclear project code named F-Go was led by Professor Bunsaku Arakatsu at Kyoto University. The Imperial Japanese Navy project is claimed to have commenced in 1943, but informally began 14 June 1941 with Arakatsu building his cyclotron at Kyoto University. Cyclotrons were particle accelerators used to bombard atoms. With these devices aspects of nuclear reactions could be tested and measured on a laboratory scale laying the theoretical groundwork for nuclear weapons. The F-Go project differed from the Army's NI-Go Project especially in their approach to Uranium enrichment. F-Go emphasised development of gaseous Uranium centrifuges. Little detail of the navy project has ever been declassified. Much of what we know today comes from Arakatsu's disclosures in interviews for post war Magazine articles. This itself was after many years of silence imposed by strict Allied post war censorship. On 15 October 1946 for example the New York Times published an interview by an ABC reporter who interviewed Prof Arakatsu Bunsuku. At page 4 of the article it was reported that Arakatsu claimed he was making "tremendous strides" towards making an atomic bomb and that Russia probably already had one. By contrast, postwar the US Government laid bare details of Nishina's far less successful Thermal Diffusion Enrichment facility at Tokyo's Riken Institute with declassification of wartime archives. Archives relating to the F-Go project remained classified and now are back in the hands of Japanese authorities, who refuse to release them. One might be forgiven cynicism for suspecting an intention to conceal the Japanese Navy's much more viable F-Go project. The name most frequently associated with Japan's wartime nuclear project is Nishina. Starting in 1931, Dr Yoshio Nishina created the Rikken Institute's Laboratory for Chemistry and Physics near Tokyo. In 1936 he built a 26 inch cyclotron to conduct basic nuclear research. The following year 1934, he built a bigger 60 inch cyclotron and then purchased a third cyclotron in 1938 from the University of California. Much of Nishina's efforts were concentrated on developing Clusius Dickel tubes. These were large steel towers with one cylinder inside another separated by a very fine gap. Through this narrow passage a corrosive gaseous compound called Uranium hexaflouride was heated and rose through thermal convection. Near the top of this tube the radioactive isotope Uranium 235 was finely deposited and collected. After the War it was revealed however, only 11 kilograms of Highly Enriched Uranium 235 was harvested this way. Not even enough for one bomb. The Rikken Institute near Tokyo where this enrichment plant was located was destroyed by B-29 bomber raids in April 1945. Japan's search for sources of Uranium led to an exchange of encyphered diplomatic signals in 1943 requesting shipments of uranium from Germany. These MAGIC decrypts alerted the Allies to Japan's nuclear ambitions starting in July 1943. At first it was intended that Japanese submarines would voyage to France to collect Uranium for Nishina's project however with the sinking of I-52 in the Atlantic in July 1944, Japan was forced to rely on east bound German U-boats. There is also evidence of an 800 kilogram Uranium oxide shipment intended for the return voyage of Japanese submarine I-52 waiting for collection at Lorient in July 1944 and 560kg of Uranium oxide captured in the cargo of U-234 upon this U-boat's surrender when War in Europe ended. When B-29s destroyed the Riken on 13 April 1945, a decision was taken to amalgamate and shift all nuclear projects to Hungnam, North Korea where Geological studies for the Navy had earlier located Uranium Ores. This joint project became known as Ni-Go. Both prior and during the War, Korea was ruled by Japan as Choesul. Hungnam was known as Konan. 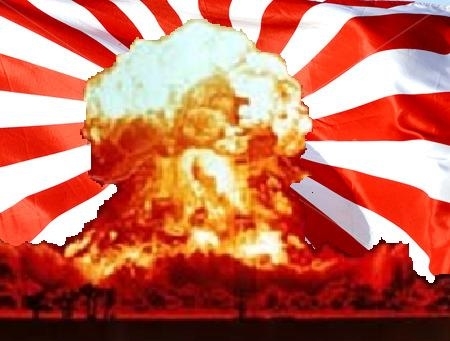 The Imperial Japanese Navy (IJN) decided to create it's own Atomic bomb project in 1943. Known informally as the Kyoto Group, IJN funded a team around the maverick scientist Prof Arakatsu with 600,000 yen in March 1943. The Imperial Japanese Navy (IJN) project to enrich Uranium 235 was led by rear Admiral Nitta Shigeru. Nitta worked closely during early stages of the project from 1942 to 1944 on isotope separation with Sakae Shimizu . Dr. Shimuzu developed F-Go’s gaseous Uranium centrifuges. This was an impressive speed since even today the best centrifuges only operate at about 50,000 RPM. The measure of efficiency for any centrifuge at enriching Uranium depends upon the speed at which the centrifuge spins. 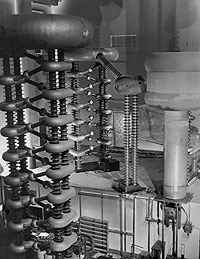 It has been claimed that these centrifuges were never built, but the revolution could not be known without testing of an actual prototype machine. The biggest hurdles for any centrifuge are in creating bearings and rotor drums able to withstand the enormous forces involved. the earliest rotors used aluminium rotors, Subsequently maraging steel construction allowed even higher speeds, but the Japanese used alloys with Rare Earth metals to create exceptionally strong rotor drums. The Nazis developed carbon fibre brushes and may have shared these concepts with Japan. It is not known whether Japan's reactor built at Kyoto worked successfully, or managed to breed any Plutonium. All wartime archives are now controlled by the Japanese Government which is under no obligation to disclose them. From March to May 1944 Uranium procurement for F-Go was taken over by Lt. Cmdr. Ishiwatari Miroshi. Kyoto University geologist Takubo Jitsutaro was employed by Japan Nitrogen Fertilizer Company (JNFC, also called by its Japanese name, Nitchitsu) to survey Manchuria and Korea looking for Uranium Ores. Before the war JNFC-Nitchitsu had created a major plant to export fertiliser to the Soviet Union. This plant also had the industrial capacity meet Japan's need for nitrates used in wartime for explosives. JNFC-Nitchitsu therefore leveraged it's huge supply of industrial hydroelectric power and ability to produce Heavy Water in it's Hungnam fertiliser plant, by funding another vital wartime project. JNFC-Nitchitsu recruited massed labourers, both Japanese, Korean and Manchurian nationals to conduct mineral sample surveys. Japanese authorities lined up thousands of Korean workers to walk, side by side, over Korean hills in search for outcrops of mineral ores which might bear radioactive elements. Even the smallest deposits were dug out, by hand if necessary. Likely findings were spirited away to JNFC-Nitchitsu for analysis. Ten significant sites bearing Fergussonite were located producing in excess of 500,000 tons of radioactive ores. These ores were shipped to Wonsan in Korea for refining to oxide and then to Konan for reduction to metal. The entire project was conducted on the same scale as Manhattan's Oak Ridge facility. In June 1944, 308,488 Yen in funding were released via the Army Aviation Bureau for development of a nuclear weapon for the purpose of aerial attack against USA. It was given the cover name for funding purposes Kokudoryoku Keikaku (Project Aeropower). This project appears to have been the founding of F-NZ. Later on 6 December 1944 a further one Million Yen were released for this project. It is this project which seems to have amalgamated with efforts by the Japanese Navy. F-NZ, or "ENNUZETTO," was a secret joint services project led by Admiral Hasagawa Hideo. Captain Mitsui was also involved with the ultra secretive F-NZ laboratory at Konan. F-NZ was said to be a joint forces amalgamation of efforts by the previous Nishina Project and the Kyoto project. It has also been associated with General Kawashima and the 8th Imperial Army Laboratory in Korea. The relationships between these organisations remains unclear. The history of F-NZ is less clear and only came to light from the escape from North Korea of Chemical Engineer Otogoro Natsume in October 1946. This forced US Army Intelligence to re-open investigation of the Japanese Atomic bomb project. Earlier in August 1945 the OSS had parachuted into Korea just one day after the formal signing of a peace agreement aboard USS Missouri. This had led to a clash with the Manhattan Committee which wanted to keep the Japanese Atomic bomb project secret. Part of this desire appears founded on a secret agreement with the Japanese for USA to acquire all research details from Unit 731 and from Japanese nuclear projects. This was highlighted in 2002 when documents about the Japanese A-bomb project were returned to the Japanese Government, which refuses to make them public. Immediately following Japan's surrender the American military Government in Japan, SCAP exercised draconian powers of censorship to silence Japan's scientists about their wartime activities. Konan was captured quite suddenly and unexpectedly by Soviet paratroop assault 24 August 1945. In October 1946 a chemical engineer Otogoro Natsume stole a fishing boat and escaped to reach American lines in South Korea where he was interrogated. Otogoro Natsume corroborated Snell's account of a nuclear test blast and asserted that scientists working for F-NZ who were captured by the Soviets, included Oishi Takeo, Wakabayashi Tadashiro, Takahashi Rikizo, Sato Sei, Fukuda Koken and Tsuchida Meiro, none were physicists and all were under the command of Admiral Hasegawa Hideo. How does Thorium figure in the Japanese Atomic Bomb project? Throughout the war all the emphasis had been on enrichment of Uranium 235, however progress with enriching Uranium 235 were unimpressive. The switch at Konan to a project developing Thorium from deposits of Monazite marked a fundamental change of approach. What is interesting to note is that whilst Nishina had experimented with Thorium from 1938-1939, he also claimed after the War that he was unaware of any Thorium project in Korea. Was he genuinely excluded from the F-NZ project? From very early in the War Arakatsu with a team of other scientists researched photo-fission of Lithium with Duteron beams. As I have noted elsewhere in this website similar research in Germany by Dr Erich Schumann and Dr Walter Trinks spawned 40 wartime patents for hollow charge A-bombs. Did the Germans somehow sell license rights for the Schumann/Trinks patents to Japan? The illustration below summarises the detonation process of crushing two conical lithium cones against a fissile target. Nowadays we call such weapons "mini-nukes." Critics dismiss the physics of Schumann / Trinks devices, however in the early 1950s these designs were the basis of an American miniature A-bomb known as the Swan Device. The Nazi weapons appeared to utilise Uranium 233 harvested from particle accelerators as Protactinium 233. This device is often referred to as the Nazi Bell. It was a device developed under Dr Walter Dallenbach by the German Army Ordnance research team Forschungstelle D. Several such synchrotron type centrifuges were built by the Berlin firm BAMAG Meguin, under contract to C.H. Muller, at Dessau where Junkers also built aircraft engines. Special flights by Junkers Ju-290 aircraft carrying crates of aircraft engines are said to have occurred during 1944, flown by aircraft with civilian pilots and Deutsch Luft Hansa markings. Could these cargoes in fact have been carried duplicates of the Nazi particle accelerator, or plans for one's construction? 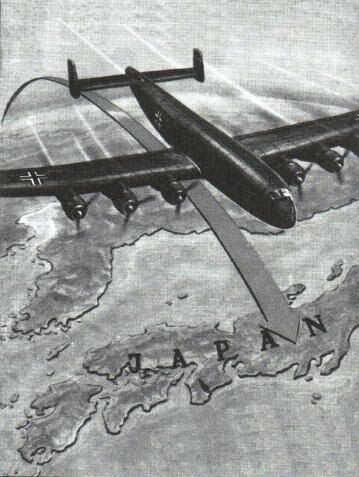 Albert Speer in his memoirs wrote of a Ju-390 flight from Bardufoss Norway to Tokyo via the "Polar Route" in 1945, flown by civilian test pilots. Two wartime test pilots who flew the giant Junkers Ju-390 also referred after the war to the Ju-390's Polar flight to Japan. Conventional cyclotrons are extremely heavy equipment and unsuited to long range flights because of the extreme weight of their magnets. The German particle accelerator device for production of Uranium 233 described by Dr Rolf Wideroe however appears from descriptions to have been lighter than a conventional Cyclotron and more like a centrifugal synchrotron. One clue to this is these particle accelerators were termed Betatrons by the Germans. The Americans however called the same concept a Caultron. During November 1945 after Japan's surrender half a dozen of these so called Caultrons were gathered by US occupation forces and dumped from a small vessel off Yokohama. These would be the type of artificial radiation sources required to transmute Thorium 232 into Uranium. Japanese scientists protested that they were not used for constructing atomic bombs, however the Allied Government was clearly spooked by information to the contrary to take such action. Photo-fission can be utilised to bombard Thorium 232 and convert it to Uranium 233, or alternately to bombard Uranium 238 and convert it to Plutonium 239. This breeding process could therefore have provided an Atomic weapon with it's fissile core. It may be therefore that the Uranium centrifuges developed by F-Go made a contribution to Japan's A-bomb. Arakatsu continued to research photo fusion during the war and wrote further papers on the topic. It could be inferred from this that perhaps photo-fusion was the path taken by Arakatsu and that F-NZ was created after F-Go to explore an entirely different approach to nuclear weapons. Successful testing of Japan's A-bomb? An article appeared in World War II Magazine (July 1995) by Al Hemingway that indicates indeed, that Japan may have exploded an atomic bomb on a tiny islet in the Sea of Japan on August 12, 1945. Hemmingway refers to a test also involving a cave. David Snell reported that Kempetai Captain Tsetusuo Wakabayashi told him the test occured just after Hiroshima was bombed. Wilcox gives an account from Snell that on 10 August 1945 an Atomic bomb was removed from a cave above Konan, transported to a robot launch. It is reported that at dawn 12 August 1945 the launch carrying the A-bomb device called Genzai Bakudan beached itself on a tiny island in the sea of Japan. The location of these islets is north of Wonsan in the Gulf of Yonghung-Man. Unfortunately the name of the individual island where the test occurred is not recorded. It is known that a Japanese plan for an Atomic Bomb was drawn up in July 1943 and came into possession of the OSS. These plans were rediscovered in 2002 and were returned to Japan where the Japanese government now controls them. A US Army surgeon based in Japan in 1947 with the 237th Medical Disp. to examine after effects of Atomic Bombs on the victims, Leon Thompson wrote to the Millitary Magazine on 9 November 1996, claiming to have seen the Japanese bomb's blueprint in the OSS offices at Tokyo. At this time OSS was known as the SSU and was about to become the CIA. Radio operator of U-234 Wolfgang Hirschfeld also wrote in an account for the website Sharkhunters, in which he caimed that Japan had alreadysuccessfully tested an atomic bomb in 1943. Conceivably Hirschfeld may be wrong that there was a test in 1943, but it is also interesting to note he was somehow informed about Japan's nuclear project before leaving Germany implying some degree of co-operation between these countries during the War years. Capt. Wakabayashi asserted to Snell that bomb laboratories hidden in caves above Konan along with a number of completed Atomic weapons were demolished to prevent their capture. Soviet paratroops captured the city unexpectedly on 24 August 1945 whilst fighting was occurring much further north along Korea's coast. This sudden attack led to the capture of six key scientists responsible for F-NZ. A chemical engineer in the F-NZ project Otogoro Natsume agreed to work for his Soviets captors and in October 1946 used the trust gained to steal a small fishing boat and escape to American forces further south. Natsume was interrogated through an interpreter by the Americans. He had also heard of the nuclear test whilst at Konan before the Soviets arrived. Natsume revealed that decomposition of Hydrogen Peroxide was part of the process involved in construction of the Atomic weapon implying that it had a thermonuclear aspect. He revealed that there were 700 university graduates working at two Factories for F-NZ. Three hundred of these graduates worked at Konan. One factory was at Konan, the other at Honbu. Natsume said Soviets arrived so quickly that they captured seven key scientists. Russians tortured the scientists by thrusting burning slivers under their fingertips and pouring water into their noses. One scientist managed to escape to the American zone but the others he learned were taken back to Moscow where they were tortured further for their secrets. Japan's biggest problem in 1945 was delivery systems. Twelve V-2 rockets had been imported by U-boat before the collapse of Nazi Germany. The correct beach in Kyushu had been identified for the intended Allied invasion in 1946. It seems conceivable that underground lunch silos would have been prepared to fire these V-2 rockets at the Allied beach head and the fleet offshore. Had these been nuclear tipped an invasion of Japan could have been carnage. Bomber missions to mainland USA were a goal but as the war dragged into it's closing sequences this became less important. 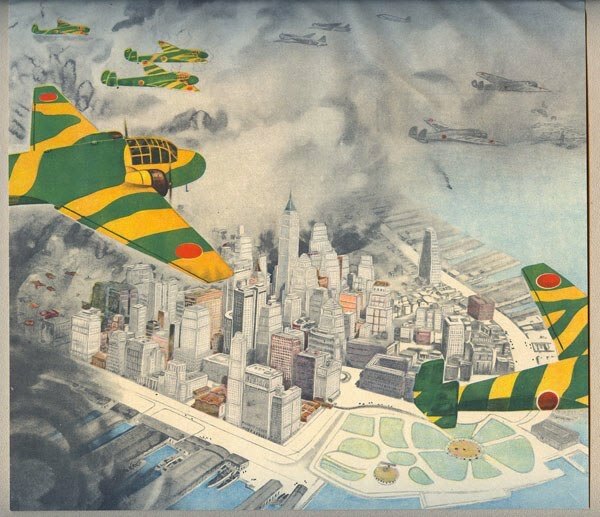 Japan was slow to grasp strategic bombing. The distances involved were immense. Honshu Island to Los Angeles was 4,720 nautical miles one way. Seattle was approximately 4,100nm. On the outbound trip a heavily laden bomber would have to climb to 30,000 feet to hitch a ride on Jetstreams and take advantage of higher ground speeds at altitude. The return journey however was against prevailing winds. The shortest possible route was from Paramushiro in the northern Kuril Group. During WW2 the island had four air bases, most with 4,000 ft runways. Had these heavily laden aircraft been able to take off from such runways then the distance to attack Seattle was an acceptable 3,040nm. Japan of course produced it's own bomber aircraft but strategic bombers came too late. One was the G8N Renzan (RITA) four engined bomber which was made from steel, as Aluminium was in short supply. It was comparable in performance to the B-17 and could never reach USA. Only four prototypes were built but one was later flown to the USA after the war for evaluation. Another prospect which might have managed a one way trip and then to ditch in the sea or possibly a two way trip by returning to Paramishiro was the four engined Kawasaki Ki-91. It could carry an 8,800lb bomb load with a total range of 6,214sm (10,000km). The factory tooled up to build these aircraft was destroyed by B-29 raids in February 1945. The G10N was developed as part of Project Z begun in 1942 which may have been associated with Project F-NZ begun in 1943. This was a high altitude aircraft with six engines. 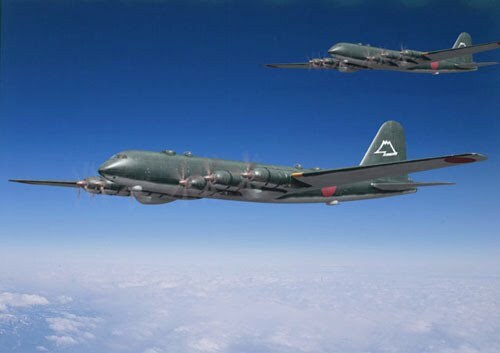 Three versions were contemplated including a 300 occupant troop carrier, a high altitude gunship with forty 20 mm guns to intercept High altitude B-29 bombers and finally a very long range bomber able to deliver up to 20,000kg or 44,000lb of bombs for distances up to 9,970 nautical miles. Originally it was intended to use six Nakajima 4-row, 36-cylinder 5,000 hp Ha-54 (Ha-505) engines, with contra-rotating propellers, however this engine due to a co-axle drive shaft became too complex so the design was shrunk to use Mitsubishi 2-row 22-cylinder Ha-50 engines developed for the Kawanishi H11K flying boat. This shrink reduced the bomb load to 11,000lb and with this the designation also changed from G10N to the G10N1 Fugaku. By 1945 all prospect of an attack on the US mainland by such large bombers was gone. The GN101 project was abandoned in 1944 and in any case the fuel crises in Japan left no spare fuel for such an attack. With the capture of Iwo Jima Mustang fighters were able to reach Japan and later aircraft carriers were able to launch raids by F-4U Corsairs from nearby waters. The I-400 class submarine also known as STo class were very large vessels capable of extremely long range with large watertight hangers for three Aichi M6A Seiran float plane bombers with foldable wings. These aircraft could be launched from catapults on the forward decks of the submarines. The first such submarine, I-401 was intended to undertake a mission with fellow float plane carrying submarines I-13 and I-14 against the Gatun locks of the Panama Canal in April 1945. Their mission with six aircraft was recalled however, possibly so aircraft could be equipped with small tactical nuclear weapons for an attack on the massed US Fleet at Ulithi Atoll. Such an attack hardly makes any sense without nuclear weapons as these aircraft could barely pin-prick such a large force with conventional weapons. Mainland USA was not the only conceivable target for a Japanese nuclear weapon. The US fleet at anchor inside Ulithi Atoll was a high priority target. A successful attack there with nuclear weapons could have halted US progress in the War, however it appears Japanese progress came too late and the Soviets were busy eying up Japanese real estate. The Allied Government of Japan practiced severe censorship in postwar Japan. Nuclear scientists involved with the wartime atomic bomb project were legally constrained from talking about it by censorship inside Japan. Vast archives of Japanese military records were seized by US forces and held in USA for 9 years after the war. In 1957 however, all Japanese military records were ordered to be returned to Japan. This was the reason given to the US Congressional POW hearings in 1986, why records of brutality towards captured servicemen could not be provided. John H. Hatcher, Army Record Management of the US Army explained, "because the problem of language was too difficult for us to overcome." The Japanese Government is under no obligation to release the information held in those records. There is no concept of Freedom of information in Japan where the government is hostile to the suggestion Japan attempted to build nuclear weapons. If this were proved it would pose a problem that it might justify the bombings of Hiroshima and Nagasaki. Stevens,David. U-Boat Far From Home, The Epic Voyage of U-862 to Australia and New Zealand, Allen & Unwin 1997. ISBN 1-86448-267-2. Stallin's Silver, by Bessant, John. King, Byron. Article: North Korea’s Nukes: Of Nukes and Ammonium Nitrate, Feb 2005, Pub. Whiskey & Gunpowder. Report Interrogation of Otogoro Natsume by Dr H Kelly, October 31 1946, NA, RG 224, Box 3. Ju-390 Chief test pilot Hans Joachim Pancherz in 1969 & Hans Werner Lerche in his memoirs.